Enroll your child in a program that’s both educational AND fun! Young writers become more powerful when they are armed with a “toolbox” of strategies. We want every student to become an author. Maybe it won’t be the next great novel, but for sure your student will write with more confidence, success, and ease when they are faced with a blank piece of paper. No homework; all work is done in class. 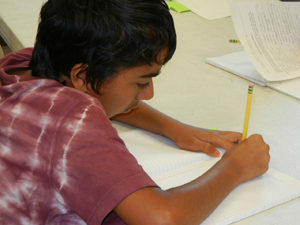 What will Writers’ Workshop give your child? All students will learn the stages of the writing process. What would you see if you took a peek into the class? Students gathering together for a teaching demonstration, followed by a sustained writing time with individual feedback and guidance from the teacher. Lastly, there is a time to share, celebrate, and reflect. What can you expect to happen in Writers’ Workshop? Your student will connect writing to reading by identifying what authors do, take personal responsibility for effective writing, and see the writing process as doable, manageable, and enjoyable. The magic of your child’s writing will come home on the last day of class. Please don’t hesitate to call or email us with questions. 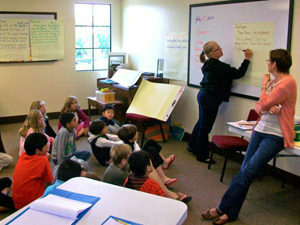 Our CLASSROOMS are at the Canyon Creek Presbyterian Church, at the corner of Bollinger Canyon Road and South Gale Ridge Road, in San Ramon, opposite the Bridges at Gale Ranch clubhouse. Our MAILING ADDRESS can be found on our Contact Us page.